The illustrated United Cutlery Knife is the Gil Hibben III Knife; designed by Gil Hibben, that features an 11" slotted clip point fixed blade made of stainless steel. The blade of this United Cutlery Knife has a notched spine and Gil Hibben signature embellishment. The laminated wood handle has a stainless steel cross guard and a stainless steel pommel with lanyard hole. A genuine leather sheath is included with this United Cutlery Knife. 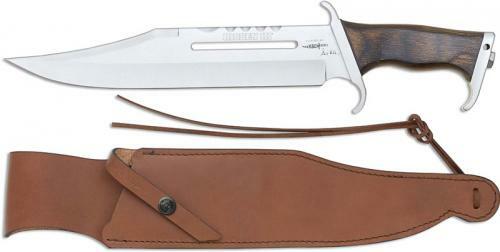 The United Cutlery Gil Hibben III Knife has an overall length of 16". All wood handles will vary in color and striation, which is part of the uniqueness of natural handle materials.